The decision to purchase a pallet wrapping machine is a big decision for most businesses. Pallet wrapping machines provide many benefits over hand stretch wrapping. For more information of possible advantages our recent blog post about stretch wrap machine advantages over hand pallet wrapping. The article explains that once volume is high enough it makes sense to purchase a pallet wrapping machine for a variety of reasons. Once the decision is made to make an investment into a stretch wrap machine, there are still a variety of questions to ask. We urge anyone buying a stretch wrap machine to accurately answer the questions below and have them ready when talking to a salesman about purchasing a pallet wrapping machine. 1. Should I buy a new or used machine? Each option offers different benefits. 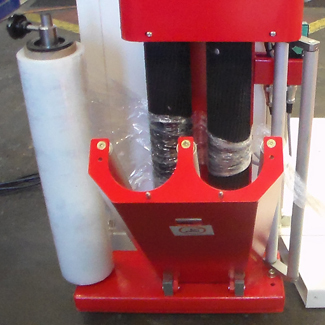 The purchase of a used stretch wrap machine can lower initial costs and offer the same benefits as new machines. The drawback is, many used stretch wrap machines are sold as-is with no warranty. Some machines manufacturers are not easily identifiable on used machines. Purchasers need to know what brand of machine it is before the purchase to obtain parts if needed. We recommend for anyone considering the purchase of a used stretch wrap machine to locate a supplier of parts for the machine and someone that can service the machine if needed. A new machine often costs more, but more than likely comes with a warranty and easily accessible parts. 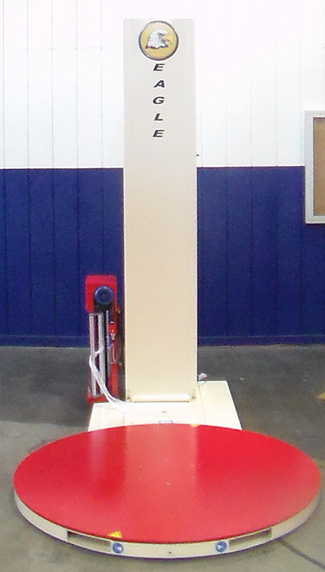 Many brands of new stretch wrap machines are capable of running years without issues. 2. What are current and projected production levels? Production levels are very important in helping to determine the proper machine. Different pallet wrapping machines offer different top end revolutions per minute. Revolutions per minute and total wraps required per load will factor the maximum production levels of a machine. Wrapping 35 pallets per day that are 48 inches in height and weigh less than 1200 lbs will require less film than wrapping 35 pallets per day that are 60 inches in height and weigh 2400 lbs. The heavier, taller pallet will require more top and bottom wraps because of weight as well as more overall wraps because of the pallet height. All of these factors are important to determine the proper pallet wrapping machine to meet production needs. 3. Does each pallet need to be weighed? Choosing a pallet wrapping machine with a scale is much more affordable than choosing to add a scale after the machine is received. Determining weighing needs prior to purchase is important for any company to consider. Other questions that should be considered should be the maximum weight needed for the scale and if a printed weight receipt required? 4. What is the maximum size of film that will be ran? Standard machine stretch film is 20 inches wide. There are a large variety of stretch film selections available in 20 inch wide machine stretch film. Companies can find different thicknesses, colored film, and vented stretch film just to name a few. Large film sizes are more limited on varieties available. Using a large film can reduce the amount of needed revolutions, therefore increasing production times. To run larger films, the film carriage on the pallet wrapper needs to accommodate the size of film being used. Purchasing a machine with an accommodating film carriage reduces headache after the machine is received. 5. Is a pre-stretched head required? This is mostly determined by the type of stretch film that will be ran on the machine. We strongly recommend purchasing a machine with a pre-stretched head to save on film costs. The only time we suggest the use of a machine without a pre-stretched head is if only a pre-stretched film will be used on the machine. A pre-stretched stretch film is already stretched up to 90% of the capable stretchability. We recommend this type of film for uniform pallet loads up to 800-1000 lb. Any loads that do not meet those requirements should be used with a stretch film that is not pre-stretched and a machine that will stretch the film during application. 6. What color of stretch film will be used? It is important to determine if the film being used will be clear or colored. It is also important to determine if the products being wrapped are black or clear. These factors will determine the type of phot-eye needed for the pallet wrapper. Dark colored products and clear products can often throw off a standard photo-eye. Some wrappers may need a black photo-eye or a laser sensor to properly wrap loads. 7. What are the largest pallet dimensions to be wrapped? 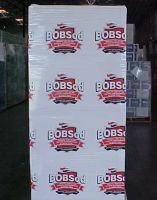 It is important to purchase a pallet wrapper to accommodate the largest pallet being wrapped. This will require a length, width, and height measurement. Tall pallets may require an extended mast machine, while wider and longer pallets may require a larger base. 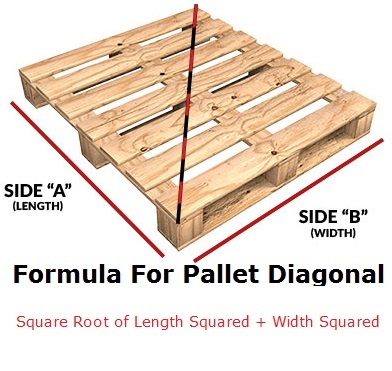 The size of the machine base needed is determined by the pallet diagonal. Which can be determined by using the formula below. 8. What type of environment will the machine be placed in? The external environment around the machine can affect performance. Machines placed in cold room storage can often require different lubricants. Machines placed in areas of high dust can sometimes require additional covers and protection. High humidity can require more frequent maintenance. Be sure to identify the type of environment before purchasing and talking to a salesman about a machine. Answering these basic questions prior to purchasing a pallet wrapping machine will help ensure the proper machine is obtained prior to purchase. This can help save headache down the road for management and workers. If you have any questions, you can call us at 1-800-441-5090 or view our online resources and store at www.uspackagingandwrapping.com.